A Chance to Say Goodbye is a heartfelt, moving reminder that loving words are never wasted. 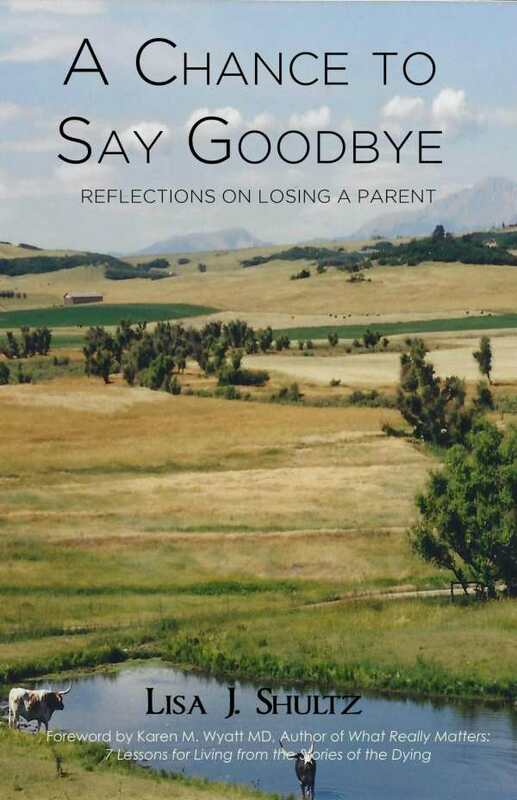 Half a memoir, half an exploration of grief, Lisa Shultz’s A Chance to Say Goodbye is a moving exploration of how one can best prepare to lose a loved one. The book starts off with a family history—an exercise that may be of limited interest to those outside of the Shultz clan, but highlights the author’s deep affection for her father and her sense of connection to her family’s roots. Historical facts are preserved alongside family details, including information about what was going on in the years that family members were born, what was on the radio, and even who family members share their birth years with. Such qualities give the text a homey charm, and nostalgia for years gone by adds to this sweetness. The life and death of Shultz’s father, Robert, provides the impetus for this exploration of grief. The author recalls how he left rural life and fought in World War II aboard the U.S.S. Missouri. Notes from the period are preserved alongside Robert’s words regarding the on-board surrender of Japan, and the retrospective warrants admiration. Shultz’s pride for her father’s historic achievements shines through, and her reflectiveness when it comes to old family wounds, particularly around her parents’ relationship, is sobering. “He seemed to grow kinder and gentler with age,” Shultz says, and as her relationship with her father improves in her adulthood, so too does her awareness of his mortality. Family stories move forward briskly to the most challenging part of their father-daughter relationship so far: preparations for final goodbyes. Ultimately, Shultz found that avoidance came more easily than acceptance, and her chapters are a reminder that a more open kind of departure might be desirable. Blunt details about the daily implications of Robert’s declining mobility are graphic but honest. The book’s pace changes when it switches to discussions of grief, affording Shultz the space to gather key moments in her mourning: the absorption of lovely scenery; the wish to reverse key moments of last exchanges. Such meditations are sympathetic, as are declarations like “deep grief is not a weakness; rather it shows that I chose to love deeply.” Accounts of handling the minutia in the aftermath of loss, including cleaning out cluttered homes, are honestly rendered and easy to identify with. The last portion of Shultz’s book will prove the most relevant for those making, or helping to make, final preparations. It draws from doctors, scholars, and fellow writers to contextualize death and grief, resulting in thoughtful, helpful recommendations, with the author’s own experiences drawn in as examples. Shultz is a self-critical guide through the process of loss, but she also seems to find some peace in the idea that her insights might help others to make healthier choices. Communication stands out as an essential tool, and Shultz’s preparatory notes are full of sage advice. Prose is clear and direct, and the end result is both reflective and encouraging. A Chance to Say Goodbye is a heartfelt, moving reminder that loving words are never wasted. In its personal nature, it makes convincing arguments against risking regret.